The Oak Hill Relays is a meet consisting of various relays that combine total times and distances from athletes from both the boys and girls track teams. Luke Beehler placed 1st overall today in long jump with a jump of 22′ 11″. The 4x100M Upperclassman Relay Team of Ethan Yoder, Natalie Gonzalez, Kalista Lamberis and Nick Felke. The 100M Dash team of Luke Beehler, Nick Felke, Natalie Gonzalez and Kalista Lemberis; The 4x400M Upperclassmen Relay Team of Ethan Yoder, Natalie Gonzalez, Natalie Gonzalez and Nick Felke. 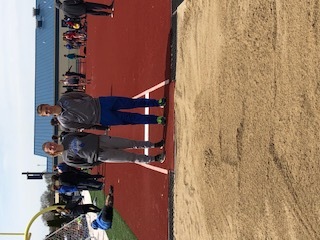 The high jump team of Rilee White, Austin Dove, Madelyn, Fuchs and Olivia Goze; The discus team of Jocob Hominiuk, RJ Gentner, Julia Hall and Rebekah Beehler; The Pole Vault Team of Nate Watts, Kolby Watts, Emerson Lemberis and Abby Leonhard. The Long Jump Team of Austin Dove, Luke Beehler, Trynitie Cox and Olivia Goze; The Sprint Medley Relay Team of Kolby Watts, Natalie Gonzalez, Kalista Lemberis and Connor Manges. The Shot Put Team of Julia Hall, Faith Rock, RJ Gentner and Kolton Kaser; The Middle Distance Relay Team of Abby Leonhard, Nick Felke, Ethan Yoder and Faith Rock; The 4x400M Underclassmen Team of Charlie Lemberis, Rebekah Beehler, Madelyn Fuchs and Kaiden Rush. The Shuttle Hurdle Relay Team of Airyona Nies, Riley Wagoner, Emily Talaga and Kaiden Rush. The 4x1600M Relay Team of Kassi Watts, Alex Menting, Ethan Sandoval and Faith Rock. The 4x100M Underclassmen Relay Team of Abby Leonhard, Rebekah Beehler, Charlie Lemberis and Kaiden Rush.